Carol's Corner: POETRY FRIDAY IS HERE! Hi Carol! That's a great poem! I wonder if she wrote it after a teen walked by texting and missing the whole beautiful day? There's so much we're missing nowadays. At Random Noodling I contemplate Keanu Reeves' proposed haiku book. I conclude with a few haiku from Basho. Kurious Kitty looks at Bye-and-Bye by Charles Wright, and, at Kurious K's Kwotes the quote is by Charles Wright. At my new blog, Kids of the Homefront Army, the poem is called "Air Raid!" Beautiful iris, and yes, the perfect poem for it! Thanks for hosting, Carol, and have a nice weekend! Thank you for hosting and for sharing such a beautiful Mary Oliver poem. Today I am sharing a poem which appears in a new book along with a link to the story of the artwork it appears with. So happy! Oops! I think I may have forgotten the link in my comment! Sorry! The Drift Record I have the final installment in my riddle series - this time with riddles from Rebecca Kai Dotlich, J.R.R. Tolkein, Mother Goose, Emily Dickinson, the Aztecs and the Congo. 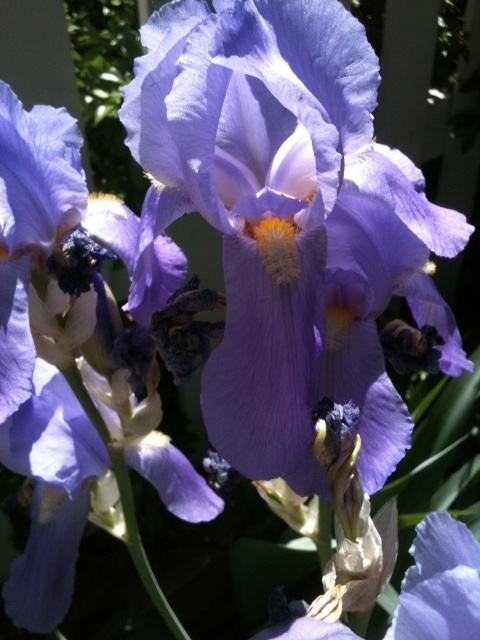 Thank you for a gorgeous iris photo and a new favorite Mary Oliver poem to go with it! I'm thinking about paying attention to the beauty of the world this week, too. It's firefly season in Ohio right now, and our wet weather has made it a great year for the flashing green lights in the lawn! Thanks for sharing that. She's so wonderful! this week i've got a collection of poems made from four-letter words found on road signs, semi-found poems i'm calling them. Thanks for hosting, Carol. This is a beautiful iris. I've not had much success with irises, though I do love them. I have an original poem about turtles this week at DoriReads. Thanks so much for doing the roundup this week. At Wild Rose Reader, I have an original cento poem that I wrote for a retiring music teacher. Whoops, that last comment is really from April. She sent it to me last night because she was going to be away today. Hop over to her site and try a trimeric- kind of fun! Hi, Carol---thank you so much for hosting. Mary Oliver is always welcome. I'm sharing a belated father's day post. My daughter, Rebecca catalogs what it's like to be a fighter pilot's daughter: The Fighter Pilot. Thanks for hosting! I always love Mary Oliver's work. I'm in with Thomas McGrath this week, and the link is here. I've put up a poem about spilling sugar. I have an original poem about eating watermelon on my site today! Thanks so much for hosting. I love that iris poem and think it would be fun to write it into a watercolor painting of an iris. Maybe that sounds random but I can visualize it! I'm Back! At Blue Rose Girls, I have an original animal mask poem titled "Grizzly Bear." I have an original poem inspired by a recent change in my eating habits. Thank you for hosting - what a beautiful photograph and poem! Here is my link to an "original" ... inspired by a busy week at home with my toddler. Poetry Friday - A Year of Literacy Coaching! My selection is "Ellington was not a street" written by Ntozake Shange with illustrations by Kadir Nelson.